COMMENTARY: A newly retired couple from England won’t likely forget what was supposed to be a celebratory trip to Norway last week that ended in anguish on a blustery Arctic dock. Nor will a stranded group of Danish tourists, a man on holiday from the Netherlands, or the undersigned on a reporting job from Oslo. All of us, and thousands of other hotel customers all over the country, faced the prospect of literally being left out in the cold, and that can put an unfortunate chill on one of Norway’s few booming industries, tourism. The British couple had perhaps the most reason to shiver, when they were left on the dock in the northern Norwegian city of Kirkenes after disembarking from one of the Hurtigruten ships that ply the Norwegian coast. They had sailed from Trondheim and were supposed to spend the night at the Scandic Hotel in Kirkenes before flying to Oslo and on to London the next day. 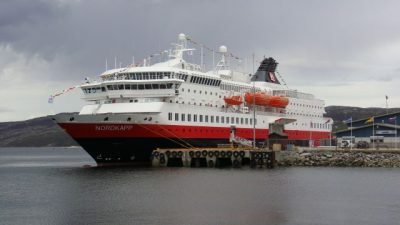 No one from the Scandic chain had notified them that it had closed because of a nationwide hotel strike, though, nor had any of the staff on board their Hurtigruten ship Nordkapp thought to alert them to the hotel strike either. “So there we were, standing on the dock while the ship sailed away,” said the couple from Northern England. The only other major hotel in town, Thon Hotel Kirkenes, was also closed because of the strike, while another smaller hostelry had been turned into refugee housing months ago and rooms were thus unavailable. The only other “tourist hotel” in town hadn’t yet opened for the summer season. A helpful taxi driver offered to call the only place in the area that was still able to take in some stranded visitors, the Sollia Gjestegård guest house located around 20 minutes out of town. A group from Denmark and the undersigned from Oslo were also among those lucky enough to secure last-minute shelter at Sollia, where staff also managed to feed their unexpected influx of guests even on the 17th of May holiday. So there was some gesture of hospitality after all, and guests could also marvel at the prospect of sleeping just 500 meters from Norway’s border to Russia. The view to the border station where thousands of asylum seekers entered Norway just last fall, and the snow-capped Russian mountains in the distance, were sights they hadn’t expected to see. The man from the Netherlands, who’d made the trip to Norway’s far north to nurture his unusual hobby of visiting border posts, wasn’t as lucky. When he faced closed doors at the Scandic, his only option was a small boarding house in Kirkenes that he described as “very bad” while still charging around NOK 1,000 a night. The Scandic, meanwhile, attempted to reopen later in the week with severely limited staffing and service. It was, at least, accepting reservations online without even mentioning that a strike was going on. While strikes always hurt “innocent third parties” the most, this one threatened to also hurt the reputation of Norwegian tourism. The Thon Hotel Kirkenes, for example, didn’t alert its guests to its closure until just two days before arrival, forcing them into a mad scramble for alternative lodging or cancellation of their trips altogether. The hotels apologized, but seemed unable to help their guests, even in a town where little alternative accommodation was available. After sitting on their guests’ money for months, because of the pre-pay requirements on their hotels’ website, it was also taking more than a week to get a refund. Meanwhile, new outlays were required for new accommodation. The hotel strike in Norway risks leaving visitors with unpleasant memories likely to be shared when they get back home. It can be argued that last year’s strike by major local airline Norwegian Air, which also disrupted travel plans for tens of thousands of people, didn’t have any lasting effect on tourism and was quickly forgotten. The hotel strike seemed different, because it tarnished visitors’ impressions and experience while they were in the country and because there clearly was a lack of communication between hotels and their guests. The hotel business’ recent boom itself, fueled by favourable exchange rates, might also have made hotel owners more inclined to meet their workers’ halfway and avoid strangling one of the few industries that’s been doing well in a country otherwise hit hard by the dive in oil prices. With the strike still deadlocked heading into its fourth week, a state mediator summoned both the hotel owners’ employers’ organization NHO Reiseliv and the trade union federation representing nearly 8,000 striking hotel and restaurant workers, Fellesforbundet, to a meeting on Tuesday. It was the latest attempt at a settlement that couldn’t come too soon, with Norway now heading into its busy summer tourism season and thousands due to descend on Bergen alone next week for the annual international arts festival known as Festspillene. The meeting with the mediator proved unnecessary, after the hotel and restaurant employers finally settled with the unions at 2am on Saturday. Hotels were due to reopen Saturday afternoon with both union and hotel officials claiming that things should soon be back to normal. Maybe not soon enough, though, to disspell the memories of many displaced visitors, likely to go home and tell their friends and family, for instance, about the shock of being left on an Arctic dock.